Check out Pinocchio (1957) on Podomatic. 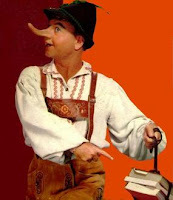 On October 13, 1957 - 50 years ago today - NBC aired a live, nationally-televised production of Pinocchio featuring music composed by Alec Wilder. It is widely considered one of the classics from "the Golden Age of Television". A video or DVD of the Pinocchio broadcast has never been released commercially, although a kinescope copy of it exists at the New York Public Library for the Performing Arts. Thanks to Nicomar for the tip!